More compelling reasons why Australia should go for the indigenous option. In my previous post, I highlighted the stand-out attributes of submarines, Australia’s need for a greater range/endurance than is available off the shelf, the difficulties of increasing the payload and mobility of an existing design and some of the issues of an overseas build, in particular Option J. How long does Australia need? Using the Collins program as an indicator, there is time to do it properly. The Collins contract was signed in 1987 and the first submarine was delivered in 1996. While there were issues to resolve, that was a nine-year design and build program for the first of class from a greenfield site. Today, Australia is in a much better position with submarine engineering and shipyard facilities than it was in 1987. The first FSM should fit into the Collins availability cycle, replacing the Collins that would have come out of Full Cycle Docking in 2028. Allowing for an extended first of class sea trials and fix period it should start sea trials in 2025. The complexity and critical national importance of the submarine capability demands dedicated, specialized management. I recommend the establishment of a Submarine Construction Authority, with appropriate industry and Defence expertise and authoritative leadership. Such an approach could build on the experience and lessons of Collins, avoid the mistakes of the air warfare destroyer alliance structure, and repeat the success of the Anzac frigate and Huon minehunter projects. An Australian design environment would aim to achieve and sustain ownership of the design for future development. That would not mean that Australia would design the vessel. Rather, it would select a submarine designer to do so while developing local expertise and specialist manpower in parallel. The goal would be to transfer the skills and intellectual property needed to perform the in-service design authority role. An objective look at the Collins program provides both valuable lessons and encouragement that the future submarine can be successfully built in Australia. The project was completed with an average schedule delay of about 26 months and within 3–4 percent of the original contract price, after allowing for inflation. The project’s aim to expend at least 70 percent of funds in Australia was comfortably exceeded. Today, over 90 percent by value of in-service work is Australian. And construction standards, demonstrated by weld rejection rates and hull circularity, were excellent, exceeding international norms. Of course, there were a significant number of design and system defects requiring rectification in the newly built submarines. That work was done successfully by ASC, supported by the Defence Science and Technology Organisation, the U.S. Navy, and industry. The submarine availability problems that have caused such poor ongoing public perception of the Collins arose from failures in in-service support arrangements rather than problems with the design and build. Moreover, the final report of the Coles review found a major improvement in Collins availability as a consequence of its recommendations being implemented. What about a hybrid approach? It’s been suggested in the Japanese media that Australia should take a “hybrid” approach, constructing the hull modules for the future submarine in Japan and assembling them in Australia. But doing so would entail all the complications of an overseas build, while precluding the optimal use of modern modular assembly, in which all major systems are installed and set to work on their shock- and noise-absorbing deck sections before those sections are slid into the open hull section, like oven trays. A hybrid construction approach would also complicate accountability for any problems injected into the build and deny Australian shipyards in Victoria and New South Wales the platform and module construction work that they performed so well for Collins. Moreover, we have an example of why an overseas build of modules is not a good idea: the experience with the bow and escape sections of the first Collins, which were built in Sweden. Both had a large number of weld defects, which took months of additional work in Australia and over $20 million to rectify. A hybrid build would likely increase, rather than reduce, cost and risk. The project would be under the full operational, legal and security control of the Australian Government. It’d be no more expensive. None of the prospective foreign suppliers is a cheap shipbuilder. Building in Australia would support broader investment in shipbuilding that could be repaid many times over across a continuous-build program. The quality of construction is likely to be better and, in any case, would be under Australian control. An Australian build would transfer design, construction and commissioning knowledge and technology to Australia – all vital steps to support the through-life evolution of what will be a uniquely Australian design. Submarines are a critical strategic capability for the uncertain times ahead. 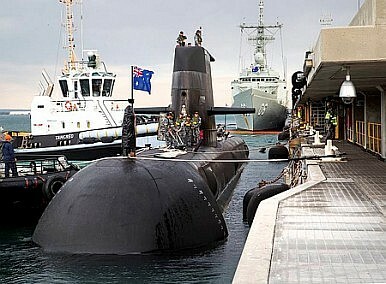 Australia’s requirements and geography demand at least 12 large submarines. Trying to stretch an existing design is a high-risk proposal with limited capability to grow to meet future changes. An integrated design process based on a designer experienced in producing for foreign customers, working with the Australian builders and the “in-service” industries, is the low-risk path. The current focus on a Japanese-built solution is misdirected and a distraction. Click here to read the Strategic Insights report: Why Australia should build its own submarines. Peter Briggs is a retired RAN submarine specialist, submarine commanding officer, and past president of the Submarine Institute of Australia. Peter has no affiliations with any of the potential suppliers to the RAN’s SEA 1000 project. This article was first published in The Strategist, the Australian Strategic Policy Institute blog, and is reprinted with kind permission. How did the onetime frontrunner fail in its bid to build Australia’s next-generation submarine?